It’s been a little while since I’ve posted anything. Little while is an understatement. Since my last post, I’ve gotten a new job and was finishing up my summer semester (an overly stressful one at that). Since I had my first day of semester 3 classes, I thought I should share one of my few school saviours. As I posted a number of weeks ago on Instagram, I bought an energy mist and yoga diffuser blend for my nebulizer from work. Saje has been my saviour since I started working there – my old job was absolutely negative, tiring… overall just draining. I don’t know where I’d be right now without my new position at Saje, but it has helped my anxiety tremendously. I haven’t had as many breakdowns as I usually did before, I sleep much better and my stress levels have been the lowest they’ve been since I can last remember. I’m going to write a separate post on products that better help with anxiety/depression at another time when I have better targeted products, but for now I’d really like to focus on the energy mist (because you know – back to school!!) and give a bit of insight on the yoga diffuser blend. 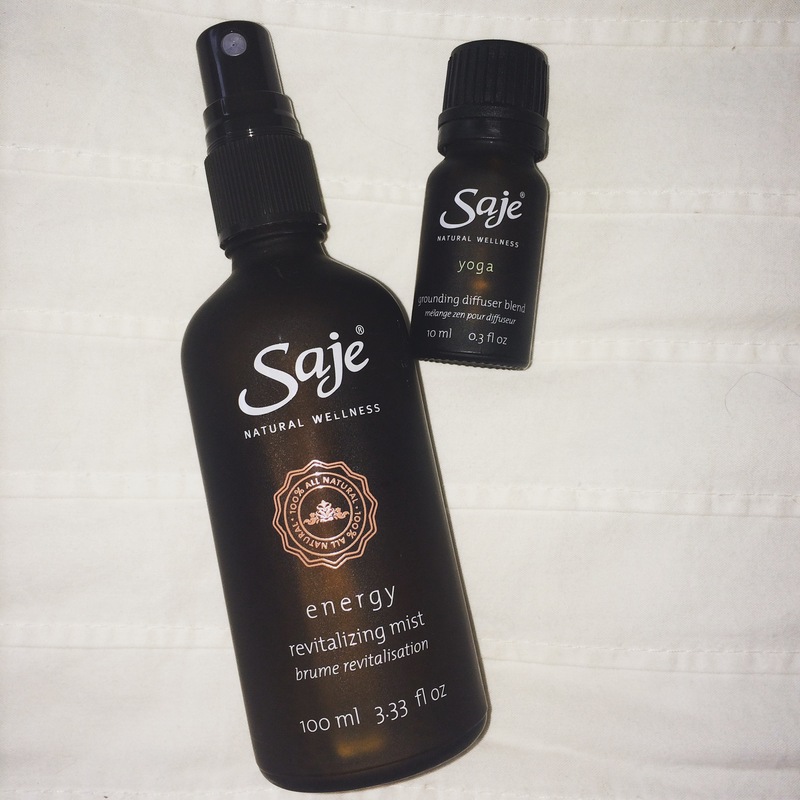 Saje Energy Revitalizing Mist: By far one of my most favourite products in the store! The day I got this was a day I wasn’t feeling well at all. My anxiety was horrible, my stomach wasn’t allowing me to properly eat and I had to leave work early which made me feel even worse because I felt like I was letting the rest of my team down. I also had so much school work to do when I got home and knowing this just somehow made my energy levels sink into what felt like the negatives. I sprayed this on me the whole afternoon/evening until bed whenever I needed a refresher and it just felt so unbelievably amazing. The one scent that really comes out is the peppermint oil. Peppermint is such a soothing yet awakening oil that does wonders. It’s an oil used in Saje’s most popular headache remedy (Peppermint Halo) so when this mist is used in conjunction with a headache, it really helps me feel a little more at ease. Lemon is also another essential oil that is infused in this mist and it really stands out along with the peppermint. I find that the lemon really comes out more in the roll on remedy of energy (check it out here). Basil and rosemary essential oils are also infused into the mist and they’re subtle yet noticeable. These four essential oils, when combined within a purified water base, really do have an amazing ability to bring your energy up. No, of course this isn’t going to bring you a caffeine high but it refreshes you and revitalizes your senses. I personally spray this on my face, chest and neck (back and front). I really take a minute out of my time to close my eyes and breathe in while concentrating heavily on the scents and allowing myself to quickly re-gather myself before facing my task(s) head-on again. Yoga Grounding Diffuser Blend: This is an essential oil blend used for Saje’s amazing Nebulizers! Nebs (for short) are ultrasonic air purifiers that fill your environment with aromatherapy given off by your choice of essential oil blends! Yoga is a blend made out of patchouli, Indian neroli, orange, champa and rosewood. This scent is – you guessed it – grounding, calming and energizing all at once. Perfect for getting down to do a task or strictly for yoga if that is what you desire to use it for.